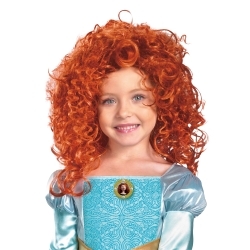 Let your child dress up as Princess Merida, the lead character from Disney's hit movie "Brave". This wig recreates her signature red curly hair. The Princes Merida child wig is colored as pictured and is one size fits most children using an adjustable elastic sizing band on the inside of the wig.